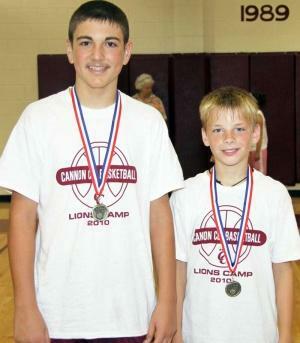 Bo Bryson, left, and Briar Jakes won the 3-point shooting competition at the CCHS Boys Basketball Camp. Take one look inside the Cannon County High School gymnasium during the last week and you would be hard-pressed to realize the economy is still not stable. When money is tight the first thing families generally cut are the non-essentials (i.e. vacations, summer camps, luxuries), but with more than 100 youngsters combined at their respective camps (during the week of June 7-10), Cannon County High School basketball coaches Michael Dodgen and Matt Rigsby consider themselves – and their programs – fortunate. In fact, the boys’ camp doubled in size to 54 campers for the 2010 summer, while the girls also saw an increase in attendance with 51 youngsters participating. Perhaps part of the reason is the quality instruction the youngsters receive and the fact both high school teams are coming off stellar seasons with several returning players (who worked the camp) probably doesn’t hurt. Rigsby was delighted with the abundance of campers who spent the week developing their skills through the assistance of Cannon County High School coaches and players. Campers spent the week developing individual skills, working on fundamentals, games and competitions and team games at the end of the day. The process and repetition continued throughout the four-day camp. The point also was made with the girls’ camp.